Lets hear what the drivers have to say about yesterday’s shakedown and their expectations for this weekend race. All the competitiors of APRC 2010 warmed up their machines as RaceRevo reports the official shakedown of APRC 2010 Round 1 right here at Tai Tak Plantation in Kota Tinggi, Johor. With the likes of Chris Atkinson, Alister McRae, Katsu Taguchi and Malaysia’s legend Karamjit Singh, we’re definitely on track for some mud whipping this weekend! 2008 was the year that the GT-R announced its arrival on the Super GT Series. Honda had dominated the series with the NSX in 2007, securing the top 4 spot in the drivers championship and the ARTA NSX finishing top in the teams championship. It’s about time for Nissan to react, so they decided to retire the 350Z and replace it with the GT-R.
Sepang International Circuit hosted the 3rd round of the 2008 A1 Grand Prix season. 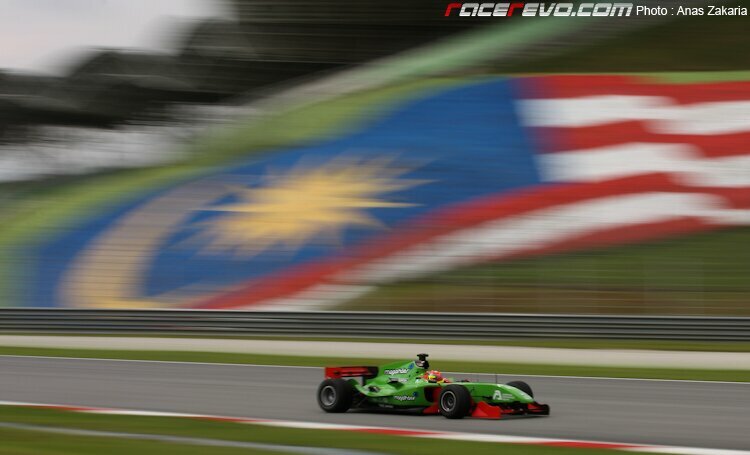 With a five point lead over A1 Team Ireland, A1 Team Malaysian is no doubt hoping to capitalize on its momentum and do something nobody has yet to achieve in A1GP – winning a race on their own home soil! While Malaysian favorites Alex Yoong and Fairuz Fauzy have led their nation to a total of five A1GP victories, a top-three finish at Sepang has currently eluded the squad despite the team’s competitiveness throughout the previous three seasons of A1GP competition.